a. Which is used by one person only. b. Which is assigned one and only one task. c. Which uses one kind of software. d. Which is meant for application software. 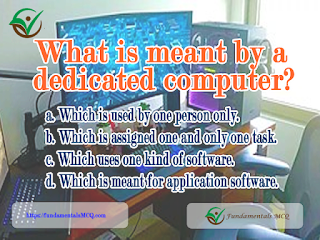 A dedicated computer would be something like a server. For example, if you have a file server, its purpose is to store and share files across the network. A general purpose computer would be something like your personal computer. It is not designed to do any one thing. It can do a little bit of everything. 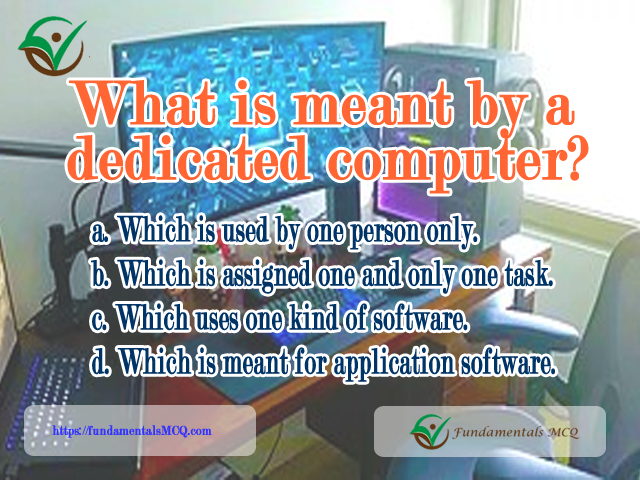 A dedicated system is a general-purpose computer system confined to performing only one function for reasons of efficiency or convenience. For example, a computer dedicated to a database may be called a "database server". "File servers" manage a large collection of computer files. "Web servers" process web pages and web applications. Many smaller servers are actually personal computers that have been dedicated to providing services for other computers. Also a mail server. A dedicated server is a single computer in a network reserved for serving the needs of the network. For example, some networks require that one computer be set aside to manage communications between all the other computers. A dedicated server could also be a computer that manages printer resources.